The Netherlands suffered an early setback in their bid to qualify for Euro 2020 as they went down 3-2 to Germany in Amsterdam. Oranje looked to have come back from 2-0 down at half-time to salvage a creditable draw, only for winger Nico Schulz to pop up with an 89th-minute winner. The result leaves the Dutch in third place in Group C behind Germany and Northern Ireland, who have taken maximum points from home games against Estonia and Belarus. The Netherlands beat Belarus 4-0 in Thursday night’s opening match in Rotterdam. Germany dominated the first half and went ahead when Matthijs de Ligt’s slip in the penalty area left Leroy Sané clear in the penalty area to score from close range. It got worse for the Dutch after 34 minutes when Serge Gnabry made it two with a rifling shot into the top corner. Only a point-blank save from Jesper Cillessen from Sané stopped Germany going into the break 3-0 up, while Ryan Babel had the best chance of the half for the home side. The Dutch showed more purpose from the start of the second half, with Memphis Depay causing problems down the left-hand side, and pulled a goal back within two minutes when De Ligt headed in from a corner. Depay added the second himself when he fired in to the bottom left hand corner in a crowded penalty area in 64 minutes. Thereafter Oranje looked more likely to score until Schulz’s late sucker punch. De Ligt, who scored his first international goal, admitted that Oranje had been second best in the first half. 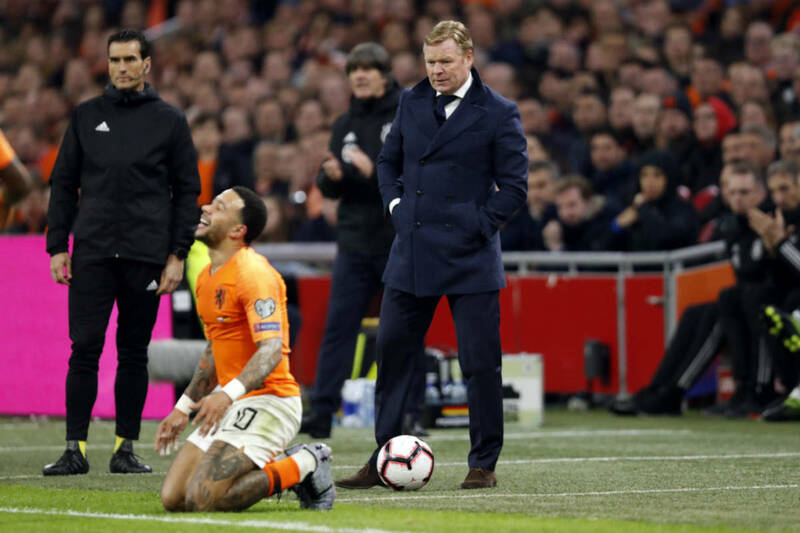 Manager Ronald Koeman said that in hindsight he might have been better to settle for the draw rather than press for a late winner. ‘I thought we didn’t start well, didn’t know exactly how Germany would play, and they were very good with three players and lots of movement up front,’ he said. ‘We weren’t good and didn’t keep the ball in the first half. But in the second half I was proud of the fact that we didn’t let our heads go down, we were 2-0 down and the second half was brilliant. But we should have had a point. Oranje’s next qualifying match is the return fixture in Germany on September 6.